211 Grays Inn Road, London WC1X 8RA. Bookings are continuing for the summer event for would-be apprentices and trainees in the creative sectors. 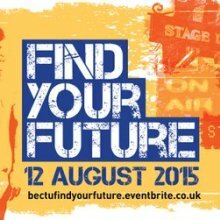 Find Your Future happens on Wednesday 12 August in London. More info below. At the heart of the event will be the all-important ‘Market Place’ where a host of employers, and key industry bodies, will be on hand with information and guidance. ABTT (Association of British Theatre Technicians), ALD (Association of Lighting Designers), Ambassador Theatre Group, BBC Academy, BECTU, Creative & Cultural Skills, Creative Skillset, DiVA, Fairfield Halls, High House Production Park, National Theatre, Roundhouse, Sadlers’ Wells, Springboard Media, Stage Electrics, Westminster Kingsway College, White Light and Youth Media Agency. The event is aimed at 16-18 year olds not aiming for further education; however all new entrants wishing to pursue the apprenticeship or trainee route in will be very welcome. Apprenticeship opportunities in the BBC. Careers & routes into the film & TV industries. Safeguarding young people entering the industry. Careers and routes into Theatre & Live events. The BBC Academy will also be hosting a a Creative Pitching session for those interested in creative roles in broadcasting. This interactive workshop will be led by Simon Broad, Head of Operations in the New Talent team. A small number of places remain for this free event; find more info on the sessions set out above and book here http://bit.ly/1Htwi9V to secure your place.